Check the battery condition monthly. 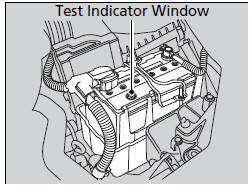 Look at the test indicator window and check the terminals for corrosion. • The audio system is disabled. • The navigation system is disabled. A PIN code will be required. When conducting any battery maintenance, wear protective clothing and a face shield, or have a skilled technician do it. The test indicator’s color information is on the battery. When you find corrosion, clean the battery terminals by applying a baking powder and water solution. Rinse the terminals with water. Cloth/towel dry the battery. Coat the terminals with grease to help prevent future corrosion. Disconnect both battery cables to prevent damaging your vehicle’s electrical system. Always disconnect the negative (–) cable first, and reconnect it last.